Last month I attended the Atlanta Baby Expo and came upon a booth for the GoTo 2-in-1 Portable infant seat and highchair. Intrigued about the product, I spoke with the representatives and watched closely at the product demonstration. At first glance, it didn’t look like it was anything too fancy, but once I put my 8 month old in it, I was in love. The GoTo 2-in-1 is a great item to have anywhere you may travel with a baby and/or toddler. It is designed to safely hold an infant car seat up off the ground, almost at eye level when sitting down. It also converts into a highchair for babies who are no longer in portable car seats. Have you ever gone to a restaurant that didn’t have a safe place to put your baby in the car seat leaving you with two options, 1) turn a highchair upside down and place the car seat on top of that or 2) leave baby on the floor, possibly being kicked or tripped over? What about going to a picnic or outdoor party that had no place to let your infant sit, so lap becomes the only option? Now you are trying to eat one handed, all while distracting your baby from grabbing at and pulling down your plate of food. Been there, done that! 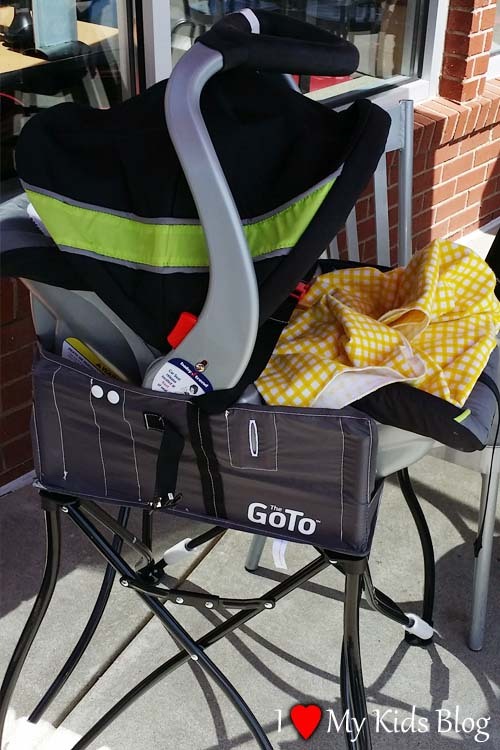 The GoTo 2-in-1 eliminates any of those issues by providing a safe and sturdy seat for your baby in their car seat or your infant in a highchair. This is not just ideal for restaurants, but also for parks, trips to the beach, camping and practically anywhere you go inside or outside the home. It comes with a carrying case and is lightweight and portable, easily fitting into your car so you can grab it and go. Phoenix Baby provided me with a GoTo 2-in-1 portable infant seat and highchair so I could form an opinion and share it with you. Regardless of this arrangement, I was not required to give a positive review. All opinions expressed are my own honest thoughts. I love this product. It is made with strong material and I feel like my baby is completely safe while using it. My 8 month old daughter loves to be outside but doesn’t like to be in a pack-in-play or crawling around on the grass. She insists on being in my arms or sitting in her stroller outside. Last week I decided to get the GoTo 2-in-1 from my car and set it up in the backyard so I could do a little gardening with her right next to me. 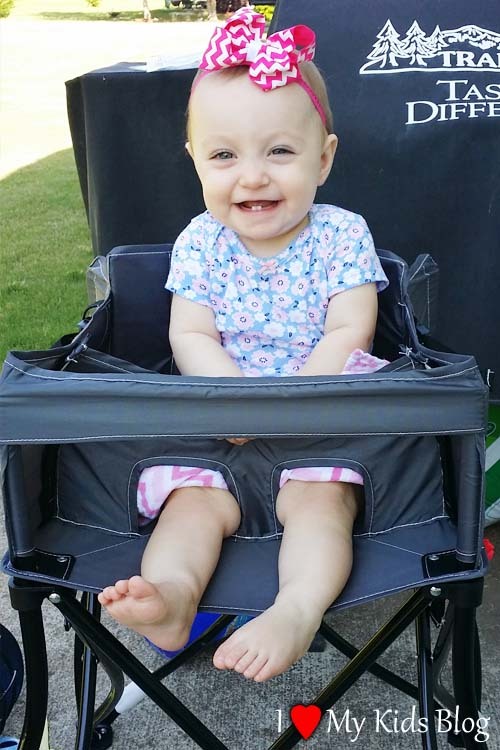 She loved being in the GoTo 2-in-1 highchair outside. She could look around at everything that was going on and was safely strapped in with the provided seat restraints. I could tell by her reaction that she too felt comfortable and safe. When we were done outside, I quickly collapsed the seat and took it into my house and set it back up for snack time. The fabric is easy to wash off and keep clean. When snack time was over, I quickly put the GoTo 2-in-1 back into the carrying case and went on with my day. 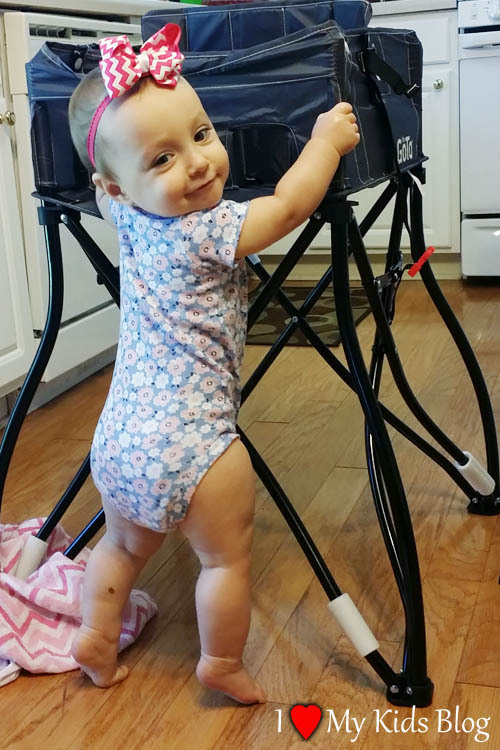 My daughter was using the GoTo 2-in-1 seat as a support to stand up with and the grips on the bottom of the chair prevented it from moving. I did not need to worry about it falling over or collapsing on her. 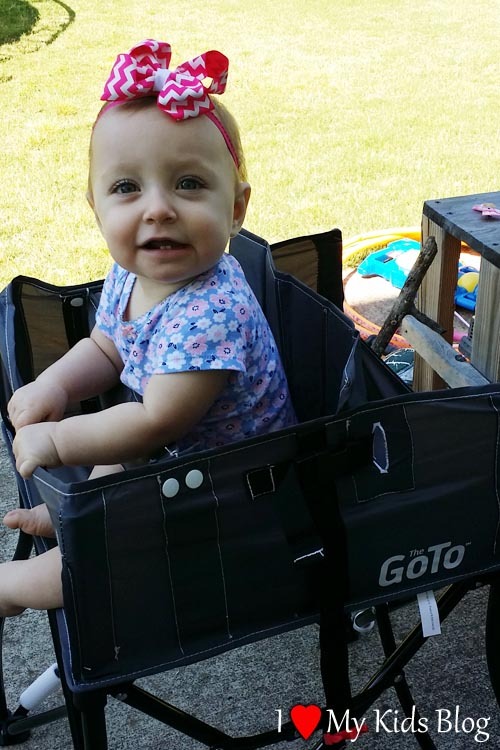 I am very excited to use the GoTo 2-in-1 infant seat on our outdoor camping and family trips this summer. It is convenient to have and will make certain activities less stressful. 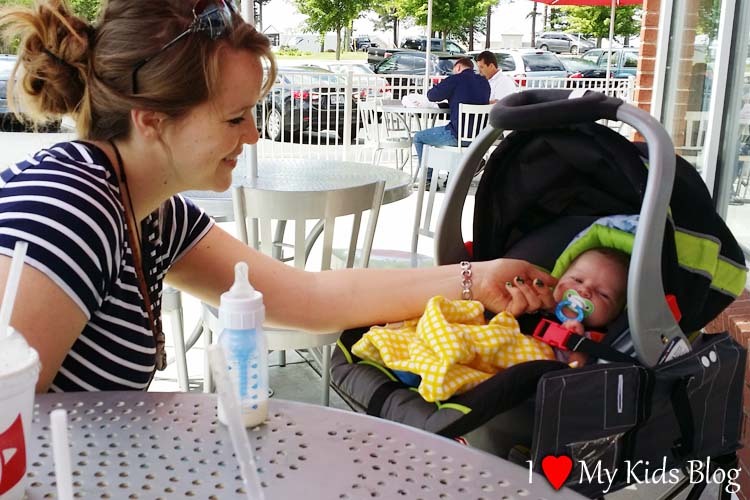 Where would you take the GoTo 2-in-1 portable infant seat and highchair if you had one?